Well, now, Irish charm, famous in song and story, does it again in the persons Donal O’Kelly and Sorcha Fox, two of the most endearing, beguiling, twist-round-your-little-finger Irish performers you’d ever have the pleasure to meet and if it wasn’t for the sheer earnestness of them you’d wonder how they ever had the gall to dash through the balderdash they dash through. Of course, it’s partially understandable because O’Kelly’s the author, isn’t he, of the cockamamie concoction he has strung together as the wild romp they play all out for all it’s worth and you have to bless them for powering through it all but even at 80 minutes and even at a ripping gallop it is a bit hard on the bum. Because what do they do? They tell, enact, gut their way through a tower of claptrap from hilarious to maundering, from nutsy fagin to poetic, from old dime novels to misty blethers, from internals to externals, with them making all the sound effects and writhings, too. And if it wasn’t for the indefatigable charm the two of them positively ooze, you’d be sorely tempted to vent razzes. Ye gods, what a yarn. Well, who should be in this abandoned church but Sister Martha, that selfsame wonderful Sorcha Fox enacting her and oh so many others and all imbued with Sorcha’s charm, even when she’s being the statue itself. And Larry accidentally breaks off a blessed hand. And puts it in his pocket. Not to worry, playwright O’Kelly weaves this into the plot, too. Sister Martha has been nunning in Nigeria these past sixteen years but was ousted thanks to the wicked machinations of a huge, malevolent oil company that’s poisoning the earth and water and making the poor little children puke, get sick and die. And she’s entrusted with a roll of film to smuggle into Ireland which is the evidence of the evil head of the evil oil company committing flat out murder. Tell no one. And trust no one. Give it only to Henry Barr. Aha! You that have been paying attention note: another roll of film! Two rolls of film! There’s plotting for you! Something clever is going to transpire you can be sure! 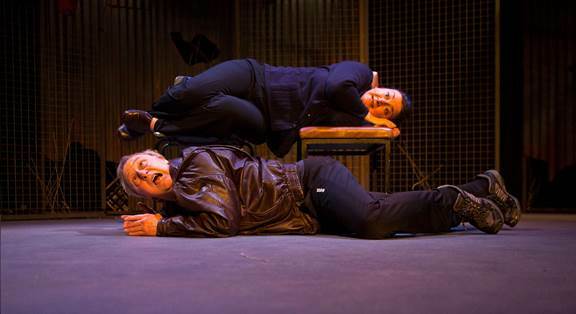 Larry and Martha endure countless episodes – little things – all described, sounded out, enacted so clearly we don’t have to deduce a thing, just read the performance. All kinds of circumstances: held prisoner, hairbreadth escapes, communes with nature, avoiding pursuit by evil Nigerians here in Ireland who want The Film. 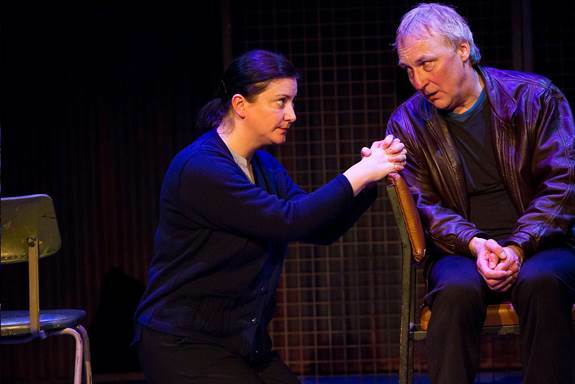 Everything at the behest of driving Jim Culleton, their director, who leaves no stone of playwright O’Kelly’s unturned, if you’ll pardon the expression, all of this in a setting by John Comiskey of wire caging artfully pierced surrounding two mismatched chairs. Everything else trolled out by O’Kelly and Fox, climbing stairs, driving vans, mucking about at a boggy pond, at a waterfall, watching a salmon, ekeing through countryside, bracing into and around Dublin, miles and miles, up, down, around, all in two chairs and an artfully pierced wire cage. Daunting. Dauntless. Until the Big Thing, right? Do they make it to the end? Do we? Ah, the charm. If you ever, ever doubted the charm of the Irish, you’ve met the epitome in Donal O’Kelly and Sorcha Fox. I give the edge to Sorcha. Little Thing, Big Thing. At 59E59 Theaters, 59 East 59th Street near Park Avenue. Tickets, $24.50 - $35. tickets@59e59.org 80 min. thru Sept 27.